Stamford's Shawn Padilla shoots as Fairfield's Joseph Bartolomeo blocks as Stamford High School hosts Fairfield Warde in a boys basketball game in Stamford, Conn., February 14, 2012. The start of the FCIAC Tournament is still days away, but try telling that to the Stamford High boys basketball team. Stamford coach Jim Moriarty told his players to treat Wednesday's contest against Fairfield Warde like "an FCIAC play-in game" as both teams entered play tied for the eighth and final playoff berth with three regular-season games remaining. And while Stamford didn't clinch a playoff berth with its 45-36 victory, nor was Warde eliminated from contention, the yelling, screaming, pushing, shoving and overall intensity displayed on the court did indeed seem to prove Moriarty right. "I labeled it an FCIAC play-in game and both teams played very aggressively," Moriarty said. "Both teams knew how important it was." "It was certainly a playoff atmosphere," Warde coach Ryan Swaller added. "It was a must game for both teams and it turned into a very physical game." With Barry Boderick scoring 19 points, including the Black Knights' last 11 in the fourth quarter, the Knights moved into sole possession of the final playoff spot. At 9-7 (10-8 overall), they are in good position to nail down the final berth, even if they split their final two games. A loss would have left them where Warde now finds itself: needing two wins ... and a whole lot of help. "We knew it was an important game," Boderick said. "Both teams had a lot of energy out there. Coach told us this was a playoff game tonight and that's how we treated it." The Knights used a deliberate, half-court offensive game to frustrate the Mustangs (10-8, 8-8 FCIAC) who had won five of six. 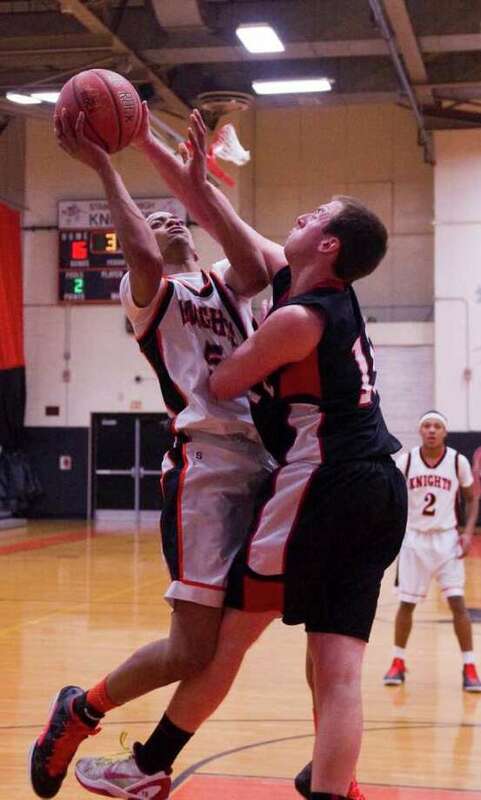 But last night the Mustangs' top player Michael Wright (10 points, 11 rebounds) was held in check, even though Stamford's Shawn Padilla was in foul trouble throughout and finished with just three points and six rebounds, although he did block six shots. Bryan Boderick added 10 points for the Knights. "This was our second-best defensive performance," Barry Boderick said, putting it just behind the Knights' upset win over Ridgefield earlier. The Knights forced 16 turnovers and held their own off the boards (34-28), although Warde outrebounded them 14-2 in the second quarter when Padilla was sitting out with two fouls. Stamford jumped out to a 13-3 lead and led 29-18 just before halftime. But Warde, led by Wright and Sal Siciliano (seven boards), got within 31-27 and trailed by six (40-34) with a minute remaining. But Barry Boderick made five free throws and the Knights forced six fourth-quarter turnovers to earn the victory. Stamford finishes with two road contests, at Central (11-5) and Harding (3-13). Warde has to beat Greenwich (9-7) and St. Joseph (16-0) just to have a chance. "The important thing is that the kids came back from Monday's loss and won a game we had to win," Moriarty said. "Now we're looking forward to making the (real) FCIAC playoffs."